The Series 16 Manual Overrides have worm-gear drive ensuring pipeline fluid flow does not alter valve position. They direct-mount without brackets and couplings on butterfly and ball valves with ISO 5211 mounting surfaces and shaft dimensions. The Series 16 Manual Overrides mounting pad accepts Flow Line Controls Series 20 and 21 pneumatic actuators and all other actuators conforming to ISO 5211 standards. The Series 16 De-clutch lever disengages the handwheel when the manual override is not in use. Flow Line Controls strongly recommends the addition of Part #NV62 Block and Vent Valve to release compressed air from the pneumatic actuator significantly reduces handwheel effort. 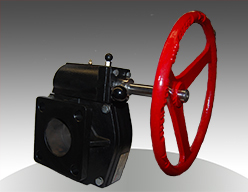 A 3-Stage Adapter may be required to link the valve stem to the actuator female drive. Refer to FLC1602 for adapter dimensions and part numbers.